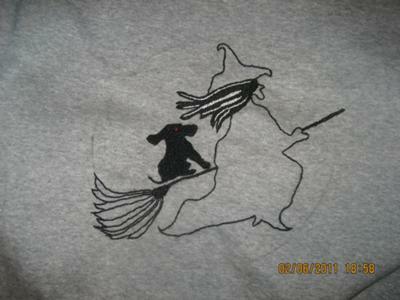 I'm hand embroidering a design on a sweatshirt for a gift. The outline and key features have gone quite well. Now I'm looking at a couple of larger expanses that need to be filled in somehow and thinking I won't live long enough to do it all by satin stitch. Colors that need to be filled in are black and white or off-white. Any ideas that will help me get these areas filled in would be awesome. I'm looking for suggestions on how to fill in the cape, hat and moon. doing this by satin stitch will take forever and likely end up distorting the shape too much. Ideas so far = beads, ribbon, felt (no), liquid embroidery. I want it to look good but may end up biting the bullet and starting to satin stitch. Glenda, had you considered doing rows of chain stitch in the hat, close together, to form a solid area? You could do something outrageous and fill the cloak with a repeating floral pattern, by scattering little lazy daisy flowers over it, perhaps black with bright green French knot centers. The moon you could fill in using long and short stitch, which is better than satin stitch for a larger area. Just some ideas, but I am sure other visitors to the site will come up with others for you.